Like the Hellcat, no additional tuning is necessary to get this Wrangler to conquer all. The Jeep Wrangler is regularly lauded by enthusiasts (even if it’s harshly criticized by reliability watchdog groups like Consumer Reports) for its cult status and ability to be easily customized. Jeep has no issue with the former of the Wrangler’s traits, but if it can keep as much of its customer’s customization budgets in house, Jeep CEO Mike Manley and friends will rest easier at night. In order for FCA's SUV division to do just that, Jeep has just pulled the covers off the Wrangler Rubicon Recon. 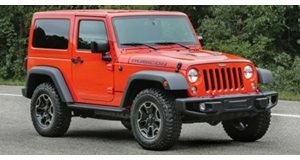 As its name states, the Rubicon Recon, which is available in two-door or four-door Unlimited guise, takes the off-road ready Wrangler Rubicon and improves on it. The aim of the Rubicon Recon’s custom parts is to add a higher level of protection to the SUV in order to give owners an extra layer of confidence when pushing the Jeep to its limits. Up front, the Recon gets a front axle upgrade that adds strengthened tubes, heavy-duty end forgings, and heavy-duty cast front and rear differential covers that dull the threatening sharp edges off rocks. Meanwhile, the Rubicon’s off-road rock rails have been shortened to accommodate for larger tires, allowing rubber up to 35 inches in diameter to fit on the SUV. Customers can choose between a six-speed manual gearbox or a five-speed auto, both of which send power through a part-time four-wheel drive system and out to the electronically locking front and rear Dana 44 axles. Aiding the rugged looks is a half-inch lift, 17-inch Low Gloss Granite Crystal aluminum wheels hugged by 32-inch tires, optional body colored fender flairs, and a dual-vented Power Dome hood. Menacing looks come standard, as they should on a Jeep designed for a post-apocalyptic world, and are enhanced by Low Gloss Granite Crystal inserts on the Low Gloss Black Grille, which is framed by headlamps that have rings embedded within them. Black bumpers with red tow hooks come standard and winch-ready. All of these off-road goodies don’t mean that the Rubicon Recon is a brute on the inside. Jeep toiled to make a special plush interior for buyers willing to shell out $39,145 for the special edition two-door and $42,945 for the four-door Unlimited version. An eight-speaker sound system can blast your favorite off-roading playlist while black leather with red stitching and red accents are strewn about the cabin. Like on a muscle car, additional gauges line the interior and display oil pressure, transmission and coolant temperature, and the air pressure inside each individual tire. Open-air trail marauders will enjoy the standard Sunrider soft top while those in colder climates may want to opt for the optional body-colored hard top. Whichever you choose, its hard to go wrong because the Rubicon Recon, which will be in dealerships later this month, is the perfect option for the Jeep enthusiast who wants a trail-gobbling SUV that needs no aftermarket parts in order for it to conquer the wilderness.